Let’s face it. The Curriculum Vitae (CV) does not work. 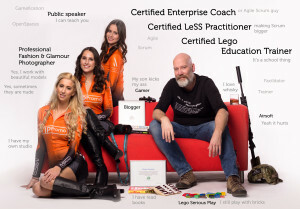 Curriculum vitae is a Latin expression which can be loosely translated as [the] course of [my] life according to Wikipedia and is used by many of as to show to potential employers what we have done with our professional lives. It is a sum of all the thing that are in the past, our former jobs, education and so on. I’m sure that you as a reader have your own version. Needly designed with the right typeface, layout and information, ready to provide at the first opportunity. Or better, ready to provide at the first demand. So why does it not work? At first, let look at the name, Curriculum vitae, course of life. It is a document that looks backwards in time. It tells what you have done. This seems something of importance but we all know that in our CV we only tell the things that we are proud of. We tell of our achievements and the victories, it doesn’t say anything about the lessons learned. The struggle, the pitfalls or the failures. Why, because we are not keen to share this and potential employers would skip your CV if you would mention them. This is strange as it is in these lessons that makes us unique and also very interesting. So we keep those difficult questions for the job interview where we have to share a little of our bad experiences but not to much as that would also jeopardize the interview and the change of being hired. So when you come to think of it we lie on our CV and try to camouflage the truth as much as we can. So first of all, what is the point in writing down the past when it is only half the real thing. And sharing a reference, same thing. You would not share the name of the manager of the job that you screwed up, or the one that screwed you up. Second, we send our CV to potential employers in the hope to move forward. To get that new job or assignment and to grow and learn more. Most of the time we do that because we have to. either the current job is ending or we are not happy at where we are. If you look back into your past all of us have jobs that we hated but also jobs that we really liked at that point in time. But there is a very small change that you would want to go back to that former job. Even if it was the greatest job in the universe, there was a reason that you moved on. Either you got bored and there weren’t enough challenges. Or the payment was bad. Maybe the company moved and you were not that dedicated to move with them, or they simply went bankrupt. Just to name a few. Either way those ships have sailed and you moved on. So why keep lingering in the past. As I mentioned before, we only tell the good things about our past experiences so again there is no point in doing this. The third thing is what we have learned. We sum up all our training, certificates, diplomas and so on. Nothing wrong with that as it is something that you have achieved and worked hard to get. But how many of you remember their basic teachings. All that gained knowledge has grown over the years and we added a lot more from experience, reading and doing. When I look at my own learning past I even got diploma’s for welding, steel machinist and even electrician. Trust me, you don’t want me in your workshop or let me do your electrical wiring. I simply forgot and probably end up making a mess of it. But still people ask me for information about that part of my life. Who cares, I moved on way beyond that knowledge. Although I still have some affection to technique. So, when we are honest about what we know, most of it is from experience and learning on the job. Even from reading but I haven’t seen a single CV where there is a prefered booklist. So three things that just look into our past and none of them makes any sense. So what should we do then. Well that is very simple. Talk about what you would like to do. Where do you want to go, what is it that you still want to learn or experience. Often we are asked to write a motivation alongside that CV. Why do we want to work somewhere? Well to be honest, I don’t want to work anywhere. I much more would like to sit in my garden drinking a cold beer and reading a good book. I would only trade that for a really nice challenge, something cool, where there are great people from whom I can learn and share my own experience with. I would love to leave my garden and cold beer if I can really make a change somewhere. And no, i don’t want to do what I did in the past. The same things over and over again, I want to grow, learn, teach and experience. When I’m asked why I want to work at a certain company I have no idea because I haven’t worked there yet. I do know they have a great product or service that I would like to get to know more of and maybe even leave my mark on it so maybe it can become even better. When you think of this as an employer, who would you rather have. Someone who has done the same thing over and over again at different companies. Or someone who is keen on doing new things, eager to grow and willing to make mistakes and learn from them. I agree that a CV provides a shallow look into someone’s past, but admit that someone’s future is much more interesting. A new thing, especially in europe is the Resumé. A short description that, when done right, tells what someone would like to do. What they want to learn and where they want to go. My CV, that I hate to use and send, is about 4 to 6 pages long. My Resumé is one page and let’s you know what I like. It has two or three lines in it about what I have done and learned. Until know I have had more success with it, than with my Curriculum Vitae. And I’m even replacing my Resumé with just a picture of myself with my passions displayed. The CV is looking backwards and somehow, the way they are written, not really reliable. You better spend time in looking what someone is willing to do and where they can take you. Don’t look for someone with ten years of experience. Look for someone who is willing to experience for the next ten years. You want energy not waste. And be honest, you want to read a small poem about someone’s dreams, not a six page history book. And if you want to know about someone’s past. Just ask them over for a nice cup of coffee, I’m sure you will switch very fast towards dreaming about the possible future instead of lingering in the past. This entry was posted in Blog and tagged Agile, Coach, new thinking, Scrum. Bookmark the permalink.